Volvo Ocean Race team Puma Ocean Racing powered by Berg have completed the second stage of the third leg from Abu Dhabi, UAE, to Sanya, China in fourth overall. 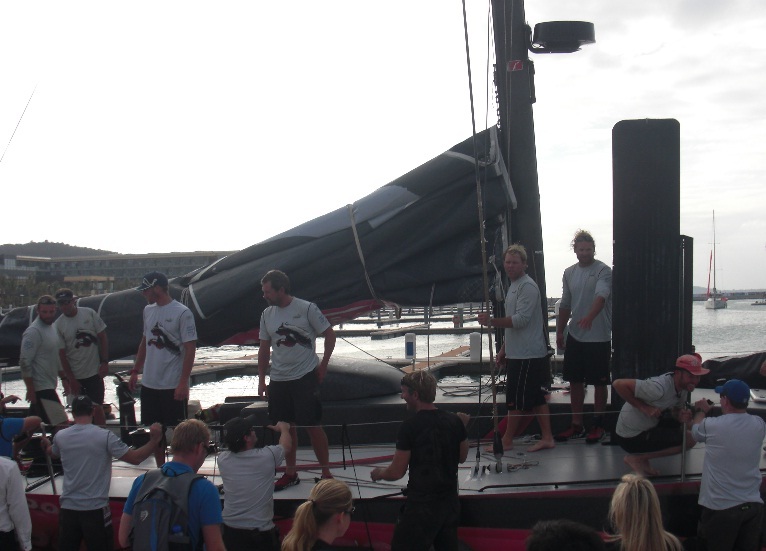 After a roller coaster leg they crossed the line at 08:29 UTC/16:29 local on Saturday 4th February 2012. The crew added 12 points to their overall total after completing the stage in 13 days, 29 minutes and 12 seconds. Puma collected 17 points total for Leg 3 and remains in fourth place in the overall standings with 48 points. Puma started the second stage of Leg 3 on Sunday, January 22, at 08:00 UTC in the safe haven port of Male in the Maldives. Through the Malacca Strait, around Singapore and up the coast of Vietnam, the crew sailed more than 3,000 nautical miles to the fourth port of Sanya. Team Telefónica won Leg 3 overall, with the Groupama Sailing Team crossing the line in second and Camper with Emirates Team New Zealand in third. On the start of the leg, Puma’s Mar Mostro demonstrated its speed up the Sharjah coastline out of Abu Dhabi, UAE, on Saturday, Jan. 14, 2012, finishing in second place in the first stage of Leg 3 with a time of 16:31:01. As was the case with Leg 2, the Leg 3 route was redrawn and split into two stages due to the threat of piracy in the Indian Ocean. Stage 1 was the one-day sprint up to Sharjah, and the second stage was the journey to Sanya. Stage 2 of the leg counted for 80 percent of the available leg points. The Volvo Ocean Race started on November 5 in Alicante, and the fleet is traveling 39,000 nautical miles through 10 ports, finishing in Galway, Ireland, in July 2012. The Puma Ocean Racing team is once again under the leadership of Read (Newport, Rhode Island, United States). Collectively, the crew has won the Around the World Race six times. The core includes: Tom Addis, Navigator (Sydney, Australia); Ryan Godfrey, Pitman (Adelaide, Australia); Kelvin Harrap, Helmsman, Inshore Tactician (Napier, New Zealand); Brad Jackson, Design Coordinator and Watch Captain (Auckland, New Zealand); Rome Kirby, Trimmer and Driver (Newport, Rhode Island, USA); Michael ‘Michi’ Müller, Bowman (Kiel, Germany); Tony Mutter, Aerodynamics Coordinator and Watch Captain (Auckland, New Zealand); Casey Smith, Systems Manager and Bowman (Brisbane, Australia); Jonathan ‘Jono’ Swain, Helmsman and Trimmer (Durban, South Africa); Amory Ross, Media Crew Member (Newport, Rhode Island, USA); Kimo Worthington, General Manager (Portsmouth, Rhode Island, United States); and Tim Hacket, Shore Team Manager (Sydney, Australia).